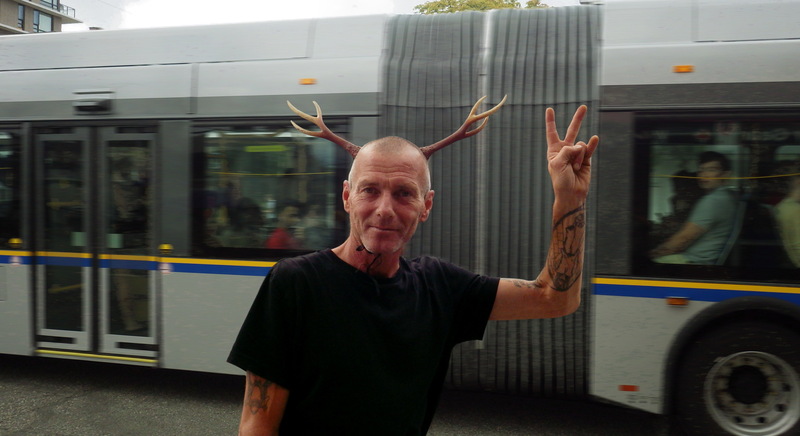 drug abuse, drug treatment, homelessness, Vancouver B.C. Jeff doesn’t ride a bike much anymore; he finds the helmets uncomfortable. If street drugs are frequently used to self-medicate symptoms of chronic emotional distress (and they are), it’s likewise true that many street drug users will try hard to self-treat their addictions, with mixed results. The DIY drug treatments I’ve seen have all taken the form of substitution. Rather than complete abstention, users try to kick a hard drug habit by trading it for softer drug habits. My formerly homeless but still big-hearted friend Jeff is a case in point. When I first met him 12 years, Jeff was a homeless binner on a bike pushing and pulling a shopping cart through the back alleys of Fairview. He had an Ontario police warrant hanging over his head and he hid his identity behind the street name of “Guy.” (pronounced like “Ghee”). Back then, and for many years to come, most of the money that Jeff earned went to feed his addiction to crack cocaine. These days Jeff still pushes a shopping cart to collect returnable beverage containers but he cleared up his legal issues some years back with a spot of community service and he now lives in one of the newer social housing complexes. Several years ago Jeff took the do-it-yourself route to drug rehab and began tapering—if not eliminating—his consumption of crack cocaine (as Jeff once said to me, regarding his drug use: “I gotta buzz!”). He effectively tried to replace crack with other, less nasty drugs. I am pleased to report that Jeff no longer smokes crack all the time—he only smokes it occasionally and he is an altogether happier and friendlier person as a result. Instead, he smokes marijuana, but only when he can get it and, of course, he still smokes cigarettes. Also—although you wouldn’t know it to look at him—every day Jeff drinks at least his weight in Cariboo-brand beer. Apropos of nothing, I’m reminded of something crudely witty that my friend Jimmy said a decade ago. And I don’t mean his heartfelt assertion that the only thing that hadn’t ever let him down in life were the drugs. I’m referring to when he was homeless and cashing in some returnable beverage containers at a the old IGA supermarket at Maple Street, on West Broadway Avenue. Prickly fellow that he could be, Jimmy took offence to the cashier’s presumptive offer of some food along with the value of the bottles. The cashier’s surprised reply was that she thought that homeless people were always hungry. It’s only as funny as it is true. And just so that you don’t think that Jimmy was a total jerk, here’s a post showing another side of him. Click the image to enlarge it. « Who cares that next week’s HAW schedule is still a mystery?